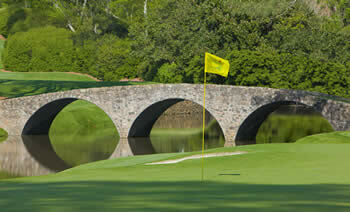 If you are into daily fantasy golf then the Masters is the tournament that you look forward to every year. It is the first DraftKings Fantasy Golf Millionaire of the year, it is an elite field of golfers to choose from and it is an event that if you follow golf you can relate to even if you’ve never been to Augusta since by now you know all the 18 holes and how each shot should be played. Making fantasy golf picks for the Masters can be easy too. There are some guys that just love playing at Augusta and year after year have great showings for DFS fantasy teams. The guys we’ve highlighted below are guys that all have a shot at winning, although 2019 probably isn’t their year to win the Masters – Those guys we’ve saved for the Who will Win the 2019 Masters Tournament page. These golfers below are guys that we expect to play well and should all make the cut and be high enough on the leaderboard to make your DFS lineups rank pretty high. Normally these are the second tier cost guys at sites like DraftKings or FanDuel so they cost less than the top tier players and allow you to match them with one or two Masters Sleeper Picks to round out your teams. Just remember to get a few lineups in for the Fantasy Golf Millionaire and take a shot at winning the $1 Million grand prize that is offered for each of the 4 golf majors. The 2019 Masters is the best time to start! Enjoy the 2019 Masters Tournament and good luck! Jordan Spieth – Spieth is a guy in the past that I have had in the Who Will Win pages because he has a stellar record at Augusta. Even last year when his season was a bit of a disaster he finished in 3rd. In five appearances at Augusta Spieth is T2 - 1 - T2 - T11 – 3. This year he is playing pretty badly again and should be a better salary cap price compared to some of the big names in the field. In my mind he loves playing the Masters and this may be the tournament that gets him back on track. Even if it doesn’t, he could still reel off a Top 10 finish. Tiger Woods – Is the old Tiger back? He has played pretty well since the end of last season and the beginning of this one. He knows Augusta and has some of his best tournaments there. If he’s ever going to win another major it will be The Masters Tournament. Will he win this year? I don’t know that but I do know that he will make the cut and should be a solid DraftKings fantasy golf pick for the Fantasy Golf Millionaire Contest and will always be a threat to win. Jon Rahm – Rahm finished in fourth at last year’s Masters and will once again be a contender this year. I still am not sold that his temper can be kept in check and if the weather acts up during the week that could unravel Rahm and keep him from winning. He played really well at the PLAYERS Championship a few weeks ago and should once again score enough fantasy golf points to make DFS players happy. Tommy Fleetwood – I so want to put Fleetwood up on the Who Will Win the 2019 Masters page because I do believe that he is all set for a jump into elite status in his career. He could still do it at Augusta but for now, know that just by picking him for your lineups you are getting a great DFS pick that should be near the top of the leaderboard and could even win the Masters. Charley Hoffman – Hoffman is having a pretty bad year and not a guy that I would actually use normally. However, in his last four years at Augusta his worst finish was a T29 and he is a perfect 5-5 lifetime at the Masters. One of those years he was in the final Sunday pairing until fading. I like guys that have a good history playing at the Masters and Hoffman fits the bill. Because he isn’t playing the best in 2019 I won’t stack all my Fantasy Golf Millionaire lineups with him…but he will be in a bunch of them at a pretty cheap salary cap cost. Matt Kuchar – Kuchar hasn’t missed a cut at the Masters since 2010 and has four Top 10’s in that span. Kuchar is built for this course and can grind out a solid finish without ever getting into trouble. There are better players than him this week that will probably win but he does have a shot at winning each year that he plays. I love him as a DraftKings fantasy golf pick because he is always a lower salary cap cost and helps out my lineups each year.